Ring Security System Review : What is it? The Ring Security System is a full DIY security system alarm with professional level quality that comes with everything you need to protect your home. The Ring Security System comes in several different packages and allows you to add additional door/window sensors and motion sensors to fully customize your smart home security package. I personally installed an 8 piece Ring Security System in my home to test it out and loved it so much that I decided to keep it. My favorite features of the security system are arming it and disarming the system with my voice from the comfort of my bed each day using Alexa and the fact that the security system doesn’t require any contracts or long term commitments. I can use the full functionality of the Ring Security System with or without the optional professional monitoring for $10 per month. The best part of the optional full professional monitoring plan is that with the plan it includes video storage of 60 days for an unlimited amount of Ring Doorbells or Ring Cameras at my address. Related Post: How to connect your Ring Security System to Alexa. Ring Security System Review : How does it work? The Ring Security System protects your house from intruders with two primary types of sensors, door and window sensors and motion sensors. The security sensors then pair to a base station that connects your sensors to the internet with wifi and and allows you to change your settings, arm you alarm or disarm your ring security system using your phone. The ring security system also comes with a keypad that you can use to arm or disarm your system just like a traditional system. The great thing about the keypad is that it is completely wireless with a rechargeable battery so you can place it anywhere without the need to run wiring. The entire ring system is completely wireless and and only the base station needs plugged in which can be placed anywhere. Related Post: Does Ring Pro Doorbell Work With Alexa? Ring Security System Review: Ring Base Station With Built In Siren & LED status light. The Ring Security System can not only protect your home from criminals but it can also use its smart sensors to help protect your from floods, freezing pipes, smoke and carbon monoxide. The Ring Alarm System works with Ring Flood & Freeze Sensors to detect water from sump pumps before they flood, leaky pipes or appliance leaks. The Ring Flood & Freeze Sensors can also be used to alert you when the temperature drops below 40 degrees in your house so you can know if your pipes are at threat of freezing and bursting. The Ring Security System works with two different types of smoke and carbon monoxide detectors. You can replace your existing smoke detectors and carbon monoxide with Ring Compatible First Alert Smart Smoke And Carbon Monoxide Detectors or you can leave your existing smoke and carbon monoxide detectors in place and the Ring Smoke Alarm & CO Listening device which detects sound from your existing smoke detectors when your smoke or carbon monoxide alarm goes off and also triggers your home alarm system. This is a great way to protect your home from fire and smoke damage if you have a large house because you might not hear the original alarm. It will also notify you if there is a fire when you are away from your home. The Ring Security System also comes in with an extremely loud built in siren in the base station that is sure to scare off intruders and alert you if something it wrong. But if you want to increase security or add security siren to a specific area of your home like your bedroom or garage you can do so with the Ring Compatible Dome Alarm Siren. The 105db siren works on batteries and can be placed anywhere in your home within range of the security system. The Ring Security System allows for full flexibility in securing and monitoring your home. You can fully secure your home with no contracts, and no monthly fees or feature blackouts. The Ring system is fully functional regardless if you purchase the professional monitoring for $10/month. If you don't choose professional monitoring your Ring Alarm System will still alarm locally and set off the built in 100+ decibel siren when tripped, it will also alert you and your family on your phone when a security breach is detected. With the Ring Security professional monitoring package you will receive a phone call from the alarm monitoring center to ensure everything is ok, and if not local police will be called to be dispatched to your alarm. The Ring Alarm System has 3 settings, with a variety of different adjustments you can make within the settings to tailor the alerts to your specific needs. The three alarm modes are Disarmed, Home, and Away. In disarmed mode you won’t set off the security system, it is completely disarmed and won’t trigger a full alarm when a motion or door sensor is tripped. In disarmed mode you can set the sensors to “chime” when a door is opened so you can hear when someone it entering or leaving your home. To arm the system from disarmed mode you can do it from the app or enter your code on the keypad and pick which armed mode you would like to set the system too. Home mode is used when you are at home but still protect your house at night or when you are sleeping. In Home mode motion sensors are disabled but all window and door sensors are still active, so if someone tries to open a door or come through a window the alarm will be triggered. The motion sensors are disabled because otherwise its possible you could trip the motion sensor while you are walking around in your house and unintentionally set off your alarm. By default the motion sensors won’t arm in home mode but you can individually choose motion sensors you would like armed in home mode if you want motion detection and have them placed in areas they wont be tripped on accident. Away mode is used when you leave your house and are gone for the day at work or on vacation. In away mode all of your sensors are active including motion, door and window sensors. If any of the sensors are tripped they will sound the alarm and alert you on the phone that your alarm has been tripped. If you have professional monitoring it will connect to the alarm company after your specified interval if the alarm is not disarmed. In any of the above modes the Ring Security System is always communicating with the base station to check on the status of the sensors and ensure that everything is alright. Inside the Ring App you can view the history of everything that the Ring Security System is monitoring even when it isn’t armed. The screen shots below show you the even history, how you can customize alarm alerts and what they main arming/disarm screen looks like on your phone. The Ring Security System will alarm locally in your home regardless if you are home or not but you can pick and choose what alerts you would like to receive when you are not home. The security system will allow you to receive both push and email notifications and if you have professional monitoring you will receive a call when the armed sensors are tripped to makes sure everything is ok. The middle graphic above shows you how you can customize what alerts you want to be notified with. The Ring Security System is easy to install but will provide the same high end security protection that “traditional security companies” provide. You start by setting up the ring security system base station then connecting the keypad, alarm sensors and range extenders if needed. The great thing about the Ring Security System is that if you need more sensors to cover windows and doors you can easily and quickly get them on amazon. The base stations setups easily once you plug it in and follow the instructions on your phone to connect it to your wifi network. You can place the Ring Security basestation anywhere you want in your house that has a good wifi connection. The Ring Basestation is the brains to the system and includes the built alarm siren. The base station is the only part of the ring security system that needs to be constantly powered. Everything else runs on batteries. I placed the security system on our second level because I wanted to be able to hear the alarm at night when sleeping. One of the best features of the Ring Security System installation is that it doesn’t require any tools to setup, anyone with a cell phone and an internet connection can quickly setup the Ring Security System by following the provided instructions. There is no complicated wiring or tools needed to set up the system. The Ring Keypad is the next item I setup. It has a built in rechargeable battery, and charges with a USB phone charger included in the box. I plugged in the keypad and followed the instructions on the app for setup. Once the key pad is charged you can place it anywhere in your house. I suggest placing it near your front door, entryway or garage, it should be in an easily accessible location when you walk into your home so you can arm or disarm when you enter and leave your home. The base kit comes with one keypad but you can add additional keypads at any entry you want. The Ring Basestation has a range of up to 250 feet but it depends on the placement of the station and the construction of your home. 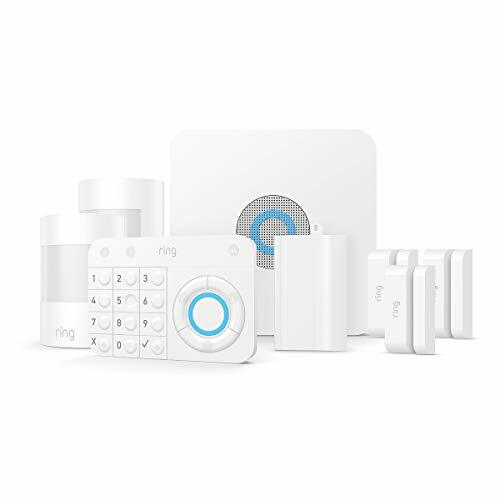 You can purchase the Ring security system as part of a package that includes range extenders or you can buy them as needed. The kit I purchased came with a Ring Security System Range Extender but I found that the base station was able to successfully connect to all of my security sensors without it. But I installed the Range Extender anyways, installing the Range Extender will increase the range of your security system, ensure fast response times for your devices and provide excellent connectivity for your security system network. The Range Extenders are a must have for larger homes and will ensure a good connection with all of your smart security devices. The Ring Window & Door Sensors work as contact sensors, and they will alert you when your door or window is opened and set off your Alarm system if armed. The Ring Window and Door Sensors are easy to install they can be installed with either the provided peel and stick high strength adhesive or using the provided screws. To set up the sensors you will first add them to the security system in the app and then physically install them on the door you want to protect. The sensors install with the larger, battery powered piece being placed on the door and the small contact portion of the door sensor being placed on the frame. In my installation I used screws to install the smaller contact portion and the adhesive to install the battery powered portion of the sensors. The adhesive has been strong and reliable, i haven’t had any issues with the mounting of the sensor and it is securely fastened. What I like about the Ring Window & Door sensors is that in disarmed mode, they will still “chime'“ at the base station to let you know when someone has opened/closed a door so you know when someone is entering or leaving the house even when the system is not armed. You can turn this feature off if you wish but the pleasant sounding chime is a nice way to alert you another family member might be entering the home when the system is disarmed. Once the sensors are armed if the door or window is opened the sensors will set off the Ring Alarm System. The Ring Security System motion sensors are battery powered and can be placed anywhere in your home. When motion is detected they will set off the alarm system alerting you to intruders. I placed the motion sensor near my entryway and tried to evade it as if I were breaking into my own house but couldn’t get by the motion sensor without setting it off. The motion sensors are inconspicuous and can mounted on a wall or placed on a shelf if you prefer. The best places to install a motion sensor are when you want to cover a large area or areas that people would pass through to get to other parts of your home like a stairway. Placing motion sensors in a garage are also a great location because you can be notified when your garage door opens. If you have a room with a lot of windows but don’t want to place a window or door sensor on each window you could use a motions sensor to cover the room rather than individual windows. The only drawback to this approach is that you won’t have as much flexibility in protecting you house in “Home” mode with window and door sensors, as you don’t typically arm motion sensors when you are home because you would set them off walking around your house. The Ring Flood & Freeze Sensor can be used to detect water or if the temperature in your house dips below 40 degree and pipes are at risk of freezing. We cover a full review of the flood sensor and all the best places to locate your Ring Flood and Freeze Sensor in another post. The Ring Flood & Freeze Sensor is a great way to protect your home from water damage and will alert you when water or cold temperatures are detected. Some of the best placements for the Ring Flood & Freeze Sensor are near your sump pump, water heater and washing machine. The First Alert Z-Wave Smart Fire &Carbon Monoxide detector works with the Ring Alarm System to protect your family from Fire, Smoke & Carbon Monoxide in your home. The Fire & CO Detector will alarm make a sound like a traditional Smoke/CO Alarm but will also alert you through the alarm system and app notifications. This is a great option to protect your house even when your are not home and especially if you have pets so you can make sure they are safe while you’re away from your house. If you don’t want to replace your existing alarms or you have hardwired alarms you can upgrade your existing alarm system without the need for any wiring or replacement of your existing alarm system. With the Ring Security System Smoke / CO Listener it’s a battery powered device that when placed next to your existing smoke detectors will integrate with your Ring Alarm System to Alert you if your Smoke or Carbon Monoxide Detectors are triggered. The Ring Security system has a built in siren in the base station in and smaller alert speaker in the Keypad. However for larger homes you might want additional sirens to alert you and ward off intruders. The Ring Security System is compatible with the Dome Siren which will Alarm just like the base station when added to your Ring Account. The Ring Security System Dome Siren is battery powered and can be placed anywhere in your home as an additional siren. I’ve chosen the Ring Security System to protect my home because it has all of the features I’m looking for in security system (door/window protection, motion detection, Alexa control, a keypad for arming and disarming, water, smoke & CO detection) and I can control all of it through the phone app. My favorite features of the system are being able to arm and disarm from my phone or use Alexa to Arm my system at night when I’m laying in bed and disarm it with my voice when I’m walking down the stairs on the way outside to take my dog out. I’ve found the system to be reliable and responsive, what I like best about the system is that I don’t have to sign a contract for the system and it has full functionality even without professional monitoring. But even with professional monitoring the cost is only $10 per month and that includes 60 days video storage for as many Ring Cameras or Ring Doorbells as I want at one address. It’s an incredible deal for both the system parts, and professional monitoring. I haven’t found a system like the Ring Security System that offers similar features and reliability for the same value as the overall Ring Security System package. Over the long term I like the idea that if I don’t want to pay for professional monitoring I don’t need too, and if I sell my house the security system will be built in and provide full functionality for them even if they don’t wan’t to pay for professional monitoring. Even with professional monitoring the Ring Security System offers huge yearly savings vs competitors.